The Paris Air Show at Le Bourget opens its doors on 17 June. Hundreds of thousands of visitors are expected at the show, where CNES will have a 300-sq-m exhibition pavilion with its eye on the future. 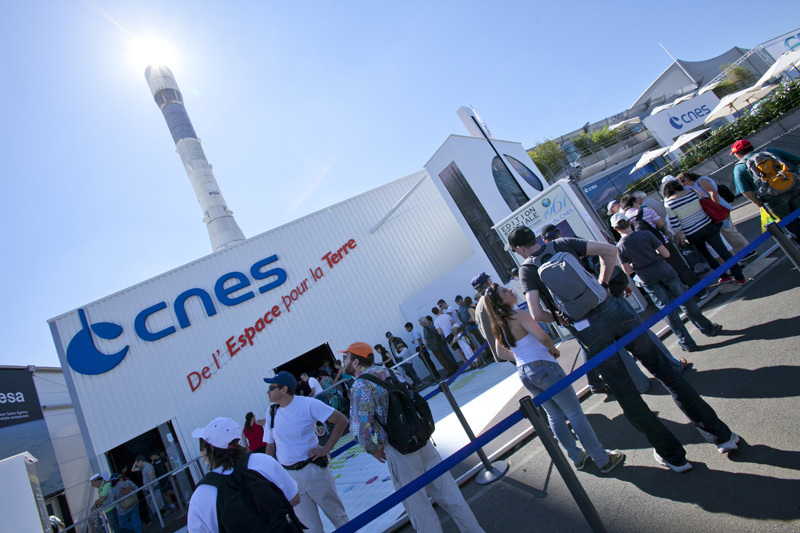 CNES at the 2011 Paris Air Show. Credits: CNES/P. Kolko. Aerospace professionals and enthusiasts will be gathering at the 50th Paris Air Show, held this year at Le Bourget airport 17-23 June. CNES’s expertise will once again be on display alongside full-scale mock-ups of the venerable Ariane 5 and Ariane 1 launchers, while its pavilion will be inviting the public on a journey... a journey that starts on the ground outside, with a 100-sq-m satellite photo of the Paris area - the largest ever produced. This exceptional picture, made possible by the capabilities of the Pleiades satellites, really is a must-see for visitors! Inside the pavilion, see Europe’s family of launchers operated all year round from the Guiana Space Centre and the future Ariane 6, on which engineers are already hard at work. Further on, a truly unique sensory experience awaits with an unforgettable voyage into the cosmos. Also among the attractions this year is a 4K ultra-high-definition screen showing pictures from the spectacular ATV control centre in Toulouse (the European ISS resupply spacecraft is set to dock with the station on 15 June). 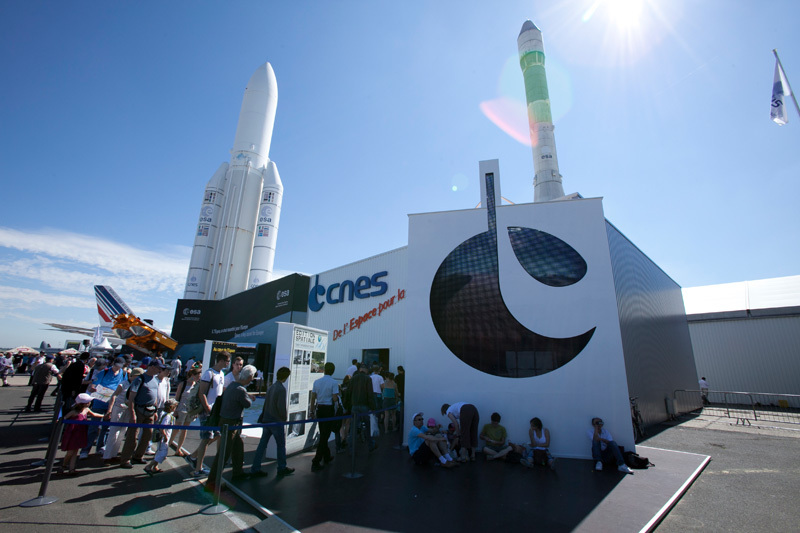 Over the 3 public days at the show, 21-23 June, CNES will be putting on a number of events, including a closer look at the most famous science-fiction films with a mediator from Universcience and free photo opportunities with Ariane 6 as the backdrop. Photos will be downloadable on line from CNES’s Facebook page. The first 4 days of the show, reserved for aerospace professionals, will of course see CNES and its new President Jean-Yves Le Gall signing a number of cooperation agreements. 50th Paris Air Show at Paris-Le Bourget, 17-23 June 2013? CNES pavilion open from 8:30 a.m. to 6:00 p.m., Monday to Sunday (entry free).